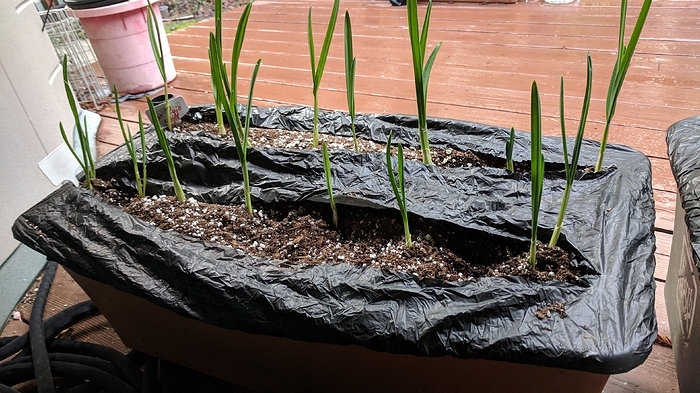 Winter gardening - what food are you growing? I always have ideas for summer plants, since I don’t have a green house, I let the soil rest for most winters. 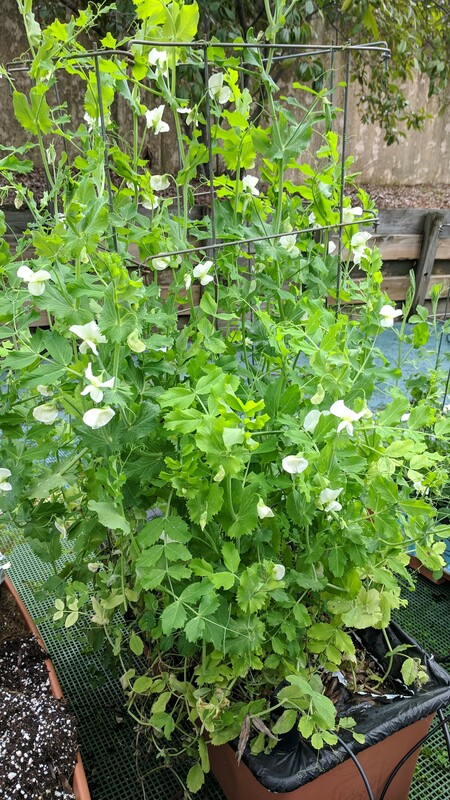 In the past, I’ve tried growing cauliflower, cabbage and parsley… I’ve tried fava beans and peas, but they are more spring crops. What are you growing for winter? Outdoor or in a green house? Last fall I had a large packet of mache seeds that hadn’t been successful for me. I sprinkled them heavily all over one of my raised beds. Completely forgot about it until come March and melting snows - I had a most intense carpet of mache for salads. So I will try that again this fall. The mache was my earliest and longest lasting greens of the season. And so delicious! Good idea, I will also try to spinkle arugula and spinach seeds to have a variety. Usually I followed the instructions on the seed package and end up having not enough leaves for salads. Now I remembered some years ago, I did have success with Bok choy, they grow pretty fast from seeds. Kale, chard, broccoli, cauliflower, beets, carrots, snow peas, fava beans, and anything else I can think of. I’m so glad you posted this, NAF, to see what inspiration I can get for other things to plant. Its still in the 90s so too warm to start many things. My fall tomatoes and eggplant were planted a few weeks back, they usually go through January. Longer if we never get a freeze. I thinned the pepper plants some but still have a couple dozen that will get to stay as long as they’re still productive. I never tried to winter tomatoes, maybe I can try this year, I have plant tomatoes in late summer, the plant are getting big now and starting to flower now or not yet flower, I will see if they can resist the cold. I think we can plant radish too, the smaller varieties for quick harvest. I have a few rows of carrots that are about 3" high. I am going to see how they over winter. I have had the sweetest carrots from the farmers market in the spring, not sure if they use special covers. I have never had very good success with carrots or spinach - thank goodness for the farmers market! I thought tomatoes can survive winter only if the local climate is really warm, like tropical or temperate-tropical? So far, the tomato plants that didn’t make any fruits this summer, their leaves are green and in good shape. I think I will try to bring 1 inside home. Others under protection outdoors to keep them warm (or to bring them indoor in January). I’m very excited to have found tree collards- already rooted- at my local nursery yesterday! I also picked up purple cauliflower and some more broccoli starters to give me a head start, I’ll plant some every few weeks to stagger the harvest. I just got around to weeding a couple of raised beds, where I’ll be planting garlic for the first time! I plan to add some compost to the beds next weekend and till it in, then plant the garlic the weekend of Halloween. I’m in Zone 7a, and from what I’ve read online the first week of November is about as late as you should go. I have three or four hardneck varieties to try, so fingers crossed for plenty of garlic scapes in the spring and tasty garlic next summer! I was hoping to get a rhubarb planting in this fall but I think I’ve waited too long. I’ll have to find a friend whose rhubarb needs dividing in the spring! I need to find myself some artichoke seeds. A few years ago grew some artichoke. No soil prep, no fertilizing, just let it grow on the ground. The result? The most spectacular artichoke I have ever tasted, with a layered taste, and a firm (for artichokes) texture, instead of the sometimes mealy and mushy texture from store-bought artichokes. And the plants looked pretty good too while they were growing. I need to find myself some artichoke seeds. Sounds like an interesting idea! Do you seed directly outdoor, or seed indoor and transplant when they grow bigger? I find that the latter method work better for me. Directly outdoor, on the ground. Just sowed the seeds and covered with soil. When the rain came, voila. This season, I’m enjoying purple tree collards, purple and green bok choys, kales (dino, scarlet, walking stick, Siberian), giant red mustard, red mizuna, tatsoi, perpetual spinach, and loads of arugula. My Bearss limes and meyer lemon trees are producing, too, although they’re young trees so I’m not harvesting much. Just the seeds for peas and fava beans. My dwarfs fruits trees are producing meyer and normal lemons. 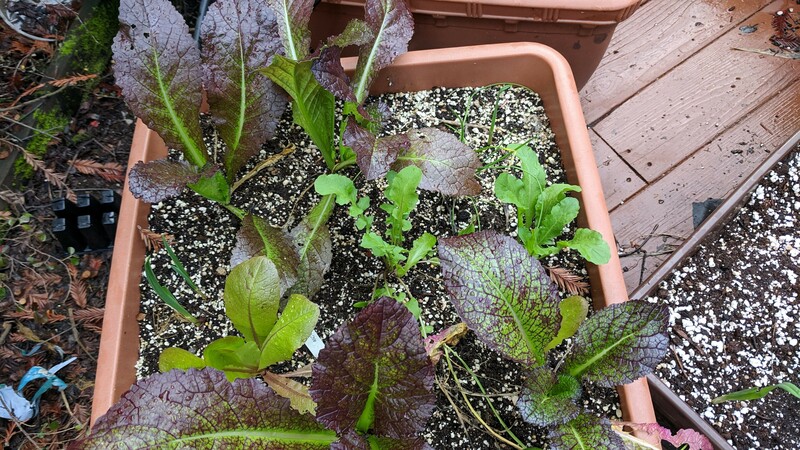 This season, I’m enjoying purple tree collards, purple and green bok choys, kales (dino, scarlet, walking stick, Siberian), giant red mustard, red mizuna, tatsoi, perpetual spinach, and loads of arugula. You are right, I should have thought of arugula and spinach, I will sow seeds this weeks. Interior sowing will begin soon for tomatoes. After I sowed, I always put a net on the soil to prevent digging, in my case the cats. A metal net can prevent birds too. I read it’s efficient against the strawberries thieves. LOL, I’m so jealous. News announcing snow tomorrow! But I should start fave beans indoors soon. Right now, I have only a few indoor orchids blooming. Yes; N Cal. First time I’ve had pea blossoms in January. They could get zapped in February. My kids were jealous when they were kids, that they DIDN’T have snow. We had to drive to Tahoe for that. Does the snow accumulate on the ground there? I never picture it with snow.